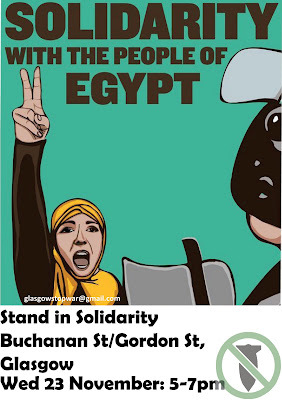 Stand in solidarity with the struggle of hundreds of thousands of people in Egypt for democracy. The death toll is rising as people demand the fall of an unaccountable military. 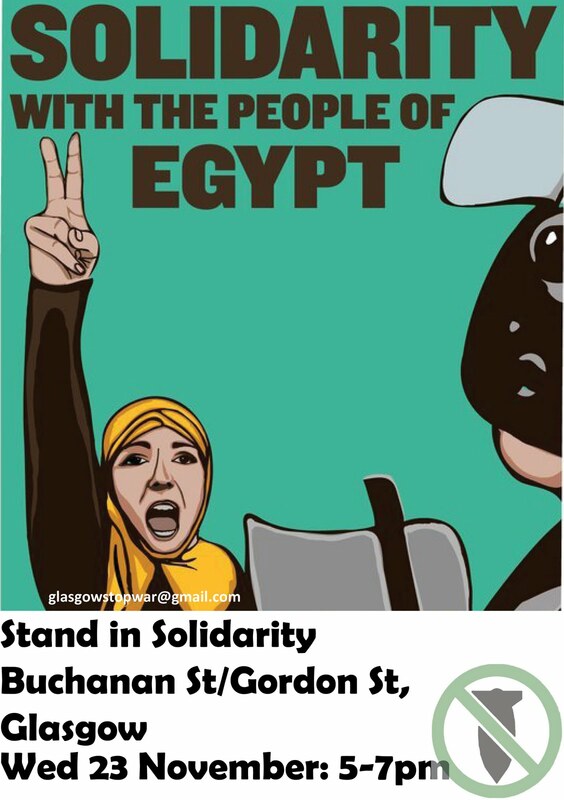 Called by the Egyptian community in Scotland and Glasgow Stop the War Coalition. from Tahrir Square, "The world is on fire here tonight. The police have been killing people and parts of Tahrir Square are in flames. There were around 100,000 people in the square this afternoon, and tens of thousands protesting in Alexandria, Suez, Aswan, Damietta and other cities across Egypt. People were killed today in Tahrir, and certainly there are more across Egypt now, and there are a thousand injured. We are drowning in tear gas. It burns the skin and the police have been shooting the tear gas canisters straight at people's faces. They are using rubber bullets and many people have lost their sight. And they are attacking us with water cannon. A few hours ago it looked as if there would be a bloodbath, but then the police suddenly withdrew from the square.